Eynsham Parish Plan 1 Sep 2007 After 18 months in the making, the committee has pleasure in publishing this report today. The Eynsham Parish Plan is a report on Eynsham in 2006-07, funded by DEFRA and the Parish Council and based on the views expressed by people who live andwork in the village. 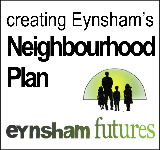 It has sought to identify Eynsham's key concerns and priorities for the future. Extracts on key topics are available to download below, as is the full report (1.38Mb).